An old understanding for the word ‘integrity’ is quite revealing about Real Estate. The current definition that most of us are familiar with is: ‘The quality of being honest and having strong moral principles.’ Yet, early on, integrity was associated with the transfer of property between people in a fair manner; think of it this way: as a property changed hands the fair process of doing so was defined as ‘the integrity of the deal.’ This integrity is expected of all the parties involved: Sellers, Buyers, and all those who support the deal. 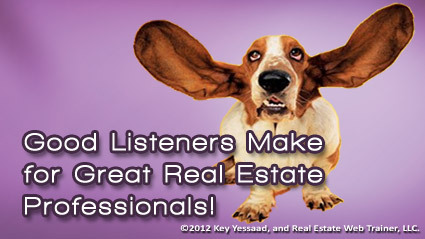 Listening then becomes one of the best asset a Real Estate Professional can develop when supporting their clients; many a deals go sour because the agent failed to truly absorb what their clients where telling them; sometimes agents don’t prod enough and start hearing what they want to hear. As the Professional you are the main advisor, coach, and guide; and your job will get easier as you commit yourself to listening and taking good notes!